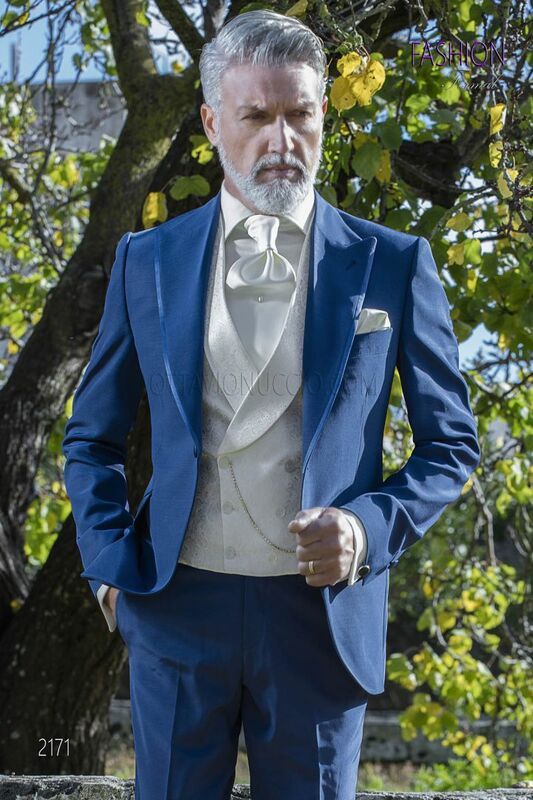 Italian wedding suit made from an electric blue wool and acetate fabric. Peak lapel with contrast fabric piping and sing... Italian wedding suit made from an electric blue wool and acetate fabric. Peak lapel with contrast fabric piping and single patterned button closure. Flap pockets with contrast trim and angled buttonholes. Single patterned button and angled buttonholes at cuffs. Single vent at back. Jacket with rounded hem at front. Standard size 50 measures 74 cm from neck to hem. Ivory brocade double-breasted waistcoat with shawl collar 6 patterned buttons and 2 double welt pockets Back lining with... Ivory brocade double-breasted waistcoat with shawl collar 6 patterned buttons and 2 double welt pockets Back lining with elastic band to adjust width.